Friday was our last day of Spring Break at the Cabin. After relaxing around the cabin, we took another hike, then went birdwatching, then went to a park by the Ohio River. Then we packed up, cleaned up and headed home. 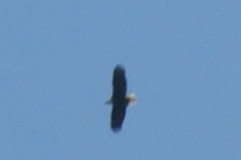 We saw several beautiful birds, but the most exciting was the BALD EAGLE we saw on two separate days that week. These are shots from the cabin...obviously, the eagle was soaring extreeeemely high. 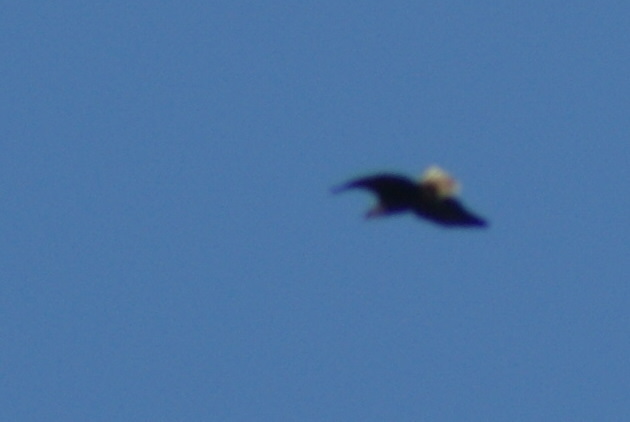 So I zoomed way in to prove to you that we have our very own bald eagle! I think these are some sort of hawk....I'll have to ask David what kind. On one of my runs that week, after running this trail I just stopped and sat awhile and let the sounds of the woods soak into my bones. Nice. We went to this abandoned homestead near our cabin to look for some gorgeous woodpeckers I'd seen there on my run....They were gone, but we had some fun with the vulture! Enjoying the last of our Spring Break....on the banks of the Ohio River! I'm so happy you had this time to rest. It looks like the kids had a blast. Nothing like celebrating God's creation to refuel. Sarah, was so glad to get to hear your Dad speak at Hobe Sound on "The Role that music plays in effective worship!" He did a great job and it inspired me. I'm sure that I heard it during my GBS days...but it was a good reminder!